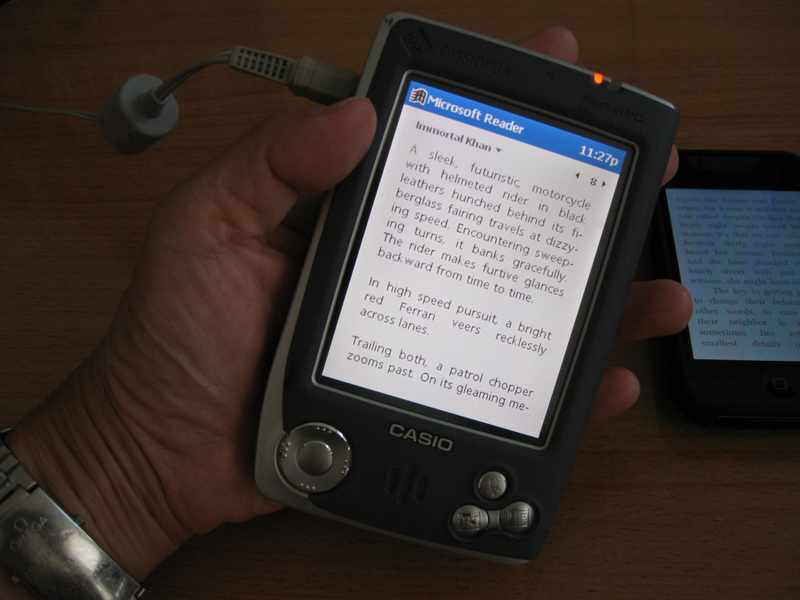 Casio and Microsoft have teamed up to produce a digital reader with adjustable, flowing text and images, highlighting, notating, and even a built in dictionary. As you can see, it features a backlit color screen that is larger than the iPhone's. The font technology uses subpixel font rendering and user adjustable and scalable fonts specifically designed for effortless reading. In addition to being a reader, the device is a true multi-purpose platform that can run various word processing, spreadsheet, and database apps. Is this one of the new Windows Phone 7 devices? Not really. In fact, you may have trouble finding a Casio EM-500 at all because it was released 10 years ago and has long since ceased production. Before the very first iPod, before cell phones became popular, there was the Windows Mobile PDA. 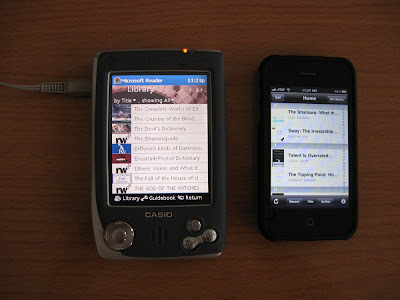 And one of the standout apps that was built-in was Microsoft Reader, one of the first ebook readers and certainly one of the greatest, even when compared against the current Kindle and iBooks apps. Both the reader and the type font technology that made it possible were developed for Microsoft by Bill Hill. 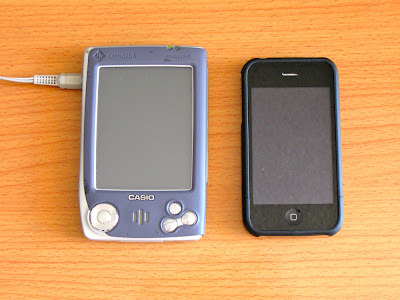 You'll notice that although the screen of the older Casio is bigger than that on the iPhone, the pixel density isn't as great -- 114 pixels per inch vs. 163 on the iPhone 3GS vs 326 on the highly touted "retinal" screen of the iPhone 4. The bigger pixels work against readability and Hill knew he'd have to wait 10 years for the technology to develop a pixel density great enough to display type clearly. But he didn't want to wait and developed a method of subdividing each pixel in a way to make fonts readable. Microsoft has abandoned Reader and it is not currently available for the newly announced Windows Phone 7 devices. There is no scarcity of great ebook reader software now. I love the Kindle app on my iPhone and iPad and I'd bet that it'll be along in WinPho7 sooner rather than later. It would be great to have a Microsoft Reader app, though. I have quite library in its .lit format and it still makes a great ebook reader. I now return you to the current era where the mad sweep of technology has rendered everything so new and different. Almost. P.S. The photos show the device "tethered" because the battery would no longer hold a charge.